ResearchPosters.com hosts tens of thousands of poster files from a variety of disciplines. Use the Conference Code supplied by your Society or Association to view a specific digital archive of meeting posters. Browse our collection of free PowerPoint Poster templates for both PC and Mac. 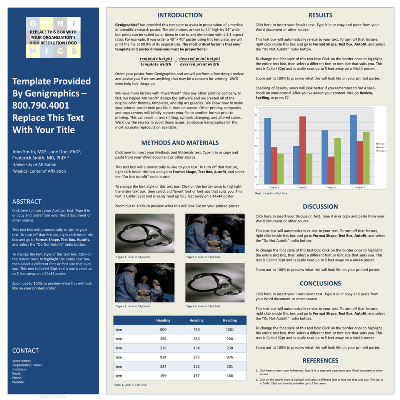 Poster templates are available in a variety of sizes and color themes and will give you fast, easy, professional results. Our ePoster Sessions enhance communication and collaboration, and serve as a permanent digital archive. 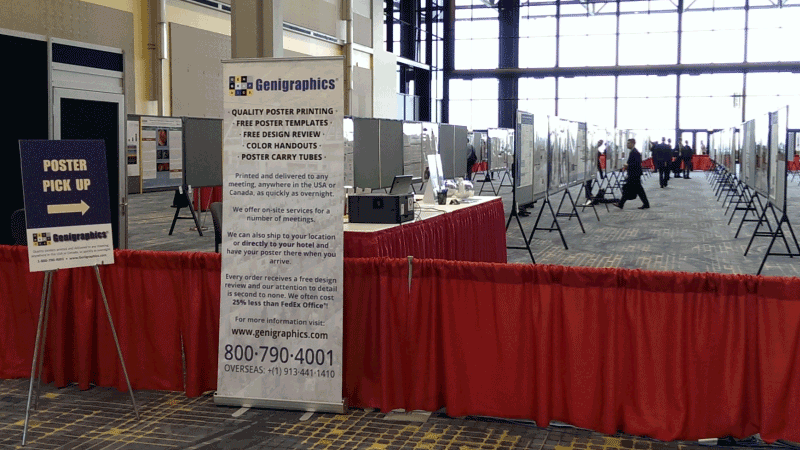 Our on-site poster pick up and poster hanging services are extremely popular with presenters. 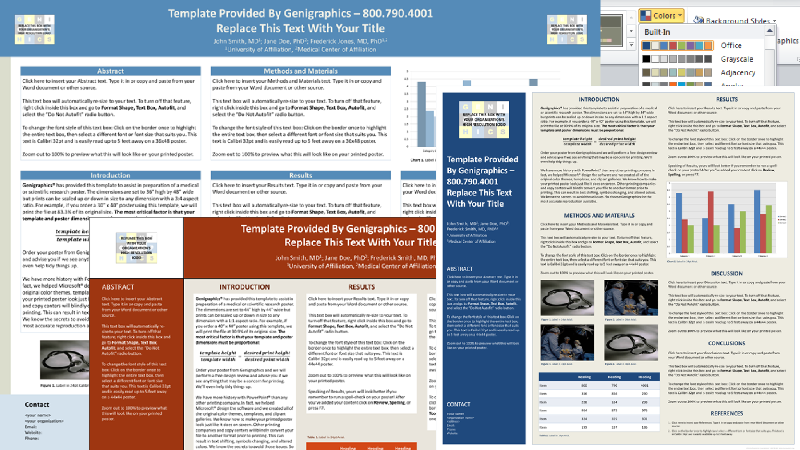 Free poster templates designed to give you fast, easy, professional results. Select one of the design tabs above to get started! If you don't see the specific dimensions you want, use a template that is the same proportion and scale it up or down at the time of printing. 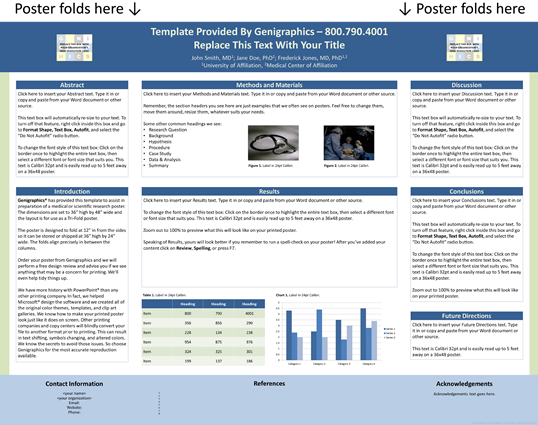 Because PowerPoint does not allow a file with dimensions greater than 56", we regularly use scaled templates for the larger poster sizes. Our 48x96 templates are actually sized at 24x48 – which we then print at 200%. For fast, affordable, quality poster printing, visit the Poster Experts at Genigraphics. Each order receives a free Design Review to ensure accurate reproduction. Choose from a wide variety of paper and finish options, including foldable fabric posters. Delivered as soon as Next Business Day anywhere in the US or Canada. 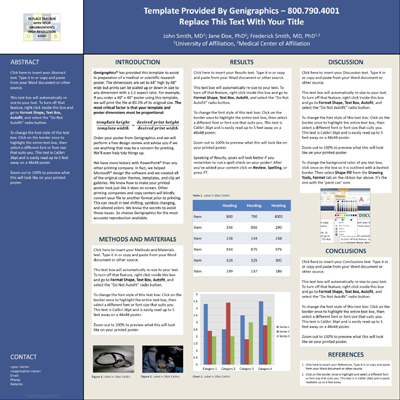 Research Poster Templates by Genigraphics LLC are licensed under a Creative Commons Attribution-ShareAlike 4.0 International License. To download a template: Click on the desired print size from the table. In Internet Explorer select "Save As", in Firefox select "Save File", and in Safari, Google Chrome, and Edge the file will save to your /downloads folder. 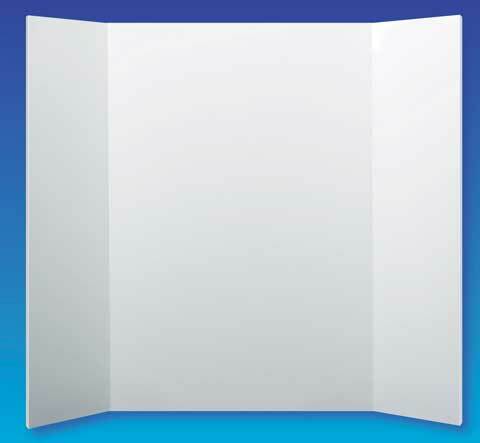 Our Tri-Fold posters are self-standing displays on 3/16" FoamCore board. The center section is 24" wide and the two 12" sides fold in for easy shipping. Choose from our economical Direct Print style, or add gloss or matte lamination for a rugged, reusable display that will last for years. 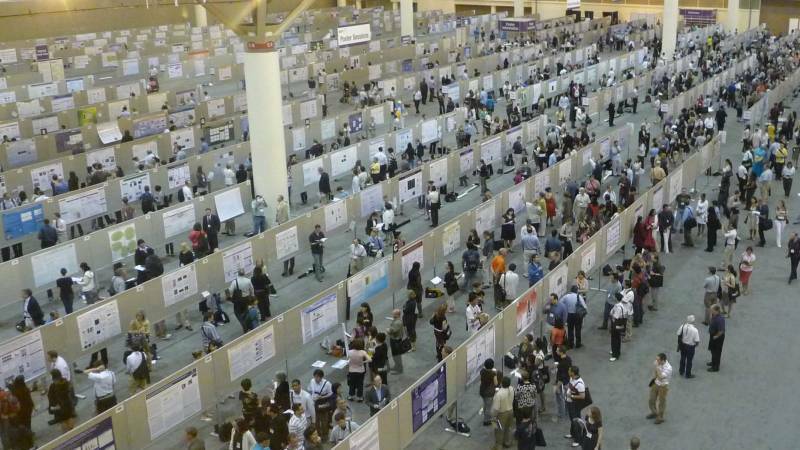 Give your membership unprecedented access to abstract posters - both during and after the meeting! 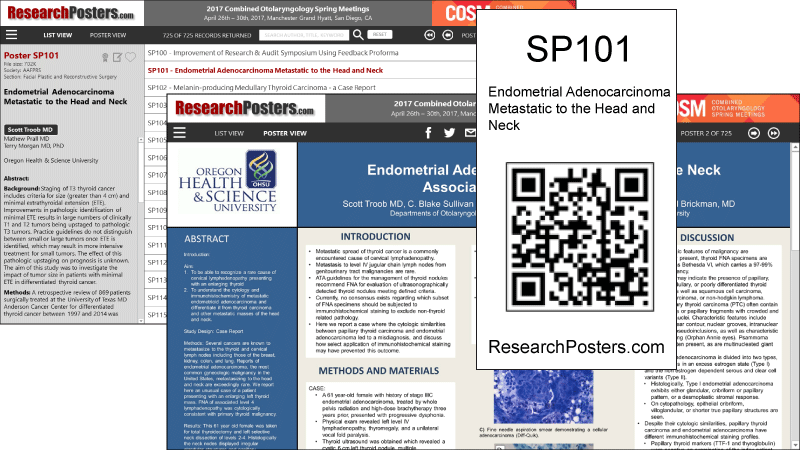 Scan the QR code at each poster board to view ePosters on tablets and smartphones. Or use our proprietary ePoster Viewer to access the entire collection in high-resolution PDF format. After the meeting, the poster session lives on as a permanent digital archive. We are the only ePoster service to offer full text search of all poster content! 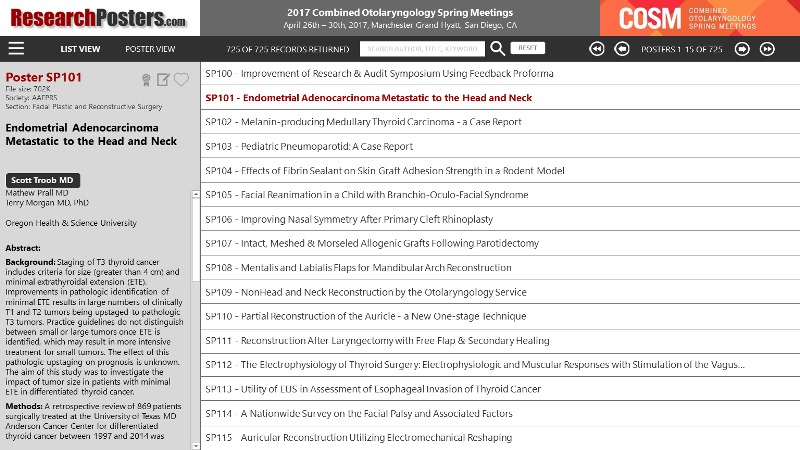 Other features include: view by track, view award winners, view favorites, search by author / title / keyword, and a poster ranking system. 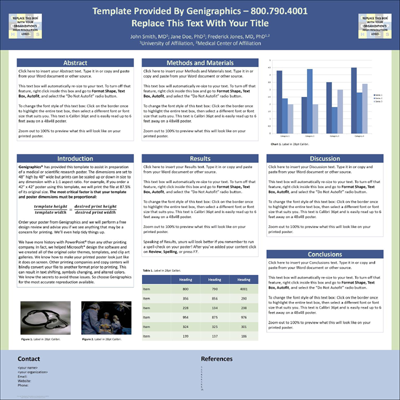 Your ePoster session includes a custom web page with poster events schedule, format requirements, free poster templates, and file submission portal. Create a revenue opportunity by adding a sponsor splash screen and logo placement in the ePoster viewer. We offer a suite of on-site services designed to help your poster session run smoothly and to provide a superior experience for both presenters and attendees. These services are included at no charge for printed poster sessions in conjunction with an ePoster package. We will supply and affix the poster board labels - complete with poster number, title, and QR code. At our staffed Poster Help Desk we provide assistance locating specific posters and demonstrate how to use the ePoster Viewer and QR Codes. We offer on-site pick up of printed posters & handouts, poster tube storage, and return shipping of posters at the end of the meeting. We also offer an extremely popular poster hanging service. We can arrange this as an optional service billed to the individual presenters, or we can provide the service for your entire poster session at a flat rate. 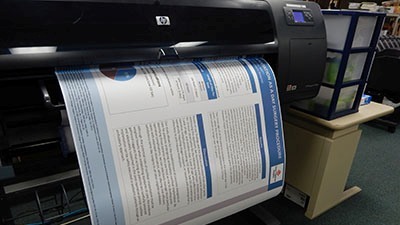 Genigraphics is a leading provider of research posters and has been delivering high quality output from PowerPoint longer than anyone in the industry. 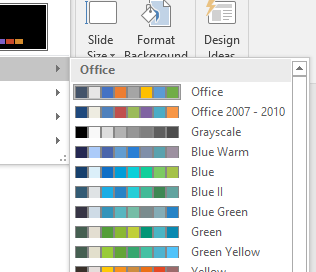 In fact, we even helped Microsoft design the PowerPoint software. Our collection of free PowerPoint poster templates are widely praised for their ease of use and fast, professional results. We offer a variety of paper finishes, laminations, and the best fabric poster on the market. Each poster order receives a complimentary design review before going to print. Typically, we fix errors and improve formatting on over 70% of the poster files we receive. Proofs are then sent to the presenter for approval before going to print. This is not only a great benefit to the individual presenter but also raises the overall quality of your poster session. Need the Conference Code for your meeting? Use of this website is subject the following terms, conditions, and notices. By using this website you agree to be bound by these terms, conditions, and notices which form a binding contract between you and ResearchPosters.com - a service of Genigraphics LLC. THIS WEBSITE AND ITS CONTENT IS PROVIDED FOR USE 'AS IS'. RESEARCHPOSTERS.COM - A SERVICE OF GENIGRAPHICS LLC MAKES NO REPRESENTATIONS OR WARRANTIES WITH RESPECT TO THIS WEBSITE OR ITS CONTENTS, ALL WARRANTIES, EXPRESS OR IMPLIED, INCLUDING WITHOUT LIMITATION THE IMPLIED WARRANTIES OF MERCHANTABILITY, SATISFACTORY QUALITY AND FITNESS FOR PURPOSE RELATING TO THIS WEBSITE AND/OR ITS CONTENT AND/OR ANY WEBSITE TO WHICH IT IS LINKED ARE HEREBY TO THE FULLEST EXTENT PERMITTED BY LAW EXCLUDED. NO REPRESENTATIONS OR WARRANTIES ARE GIVEN AS TO THE ACCURACY OR COMPLETENESS OF THE INFORMATION PROVIDED ON THIS WEBSITE, OR ANY WEBSITE TO WHICH IT IS LINKED. You may not redistribute any of the content of this website or create a database in electronic form or manually by downloading and storing any such content. The authors of any submitted poster or related narrations retain copyright through a standard non-commercial Creative Commons license. ResearchPosters.com - a service of Genigraphics LLC will not display work online until after it has been displayed at the conference (unless expressly agreed with the submitter and the conference organizers). Inclusion in an ePoster session should not affect your intellectual property rights beyond display of your work in the public arena of the conference. Furthermore, display of an ePoster submission is for the exclusive, limited use of the participating society and its members, and is not to be deemed as publication. ResearchPosters.com - a service of Genigraphics LLC will comply with all embargoes as set by the conference/society organizers, and ensure that posters do not go live on our site before the lifting of any such embargoes, irrespective of when the work was uploaded to us. ResearchPosters.com - a service of Genigraphics LLC is fully committed to protecting your privacy. If you wish to correct, update or remove any information about you that may be in our records, please send us an e-mail with the details of your request. If you wish to contact us further, please find complete contact information on our contact page.